The idea behind this post is quite simple. During my childhood back home, street vendors sold all kinds of snacks in small paper cones – toasted sunflower seeds, berries, nuts, candy, and other homemade treats. The food varied depending on the season and the part of the country. The cone is an inexpensive, simple container that was usually rolled and filled right on the spot. During recess at school, we would often run across the street to a small market and buy whichever snacks were sold that day. Then we would proceed to sit in the schoolyard with our paper cones, gossiping and munching away. 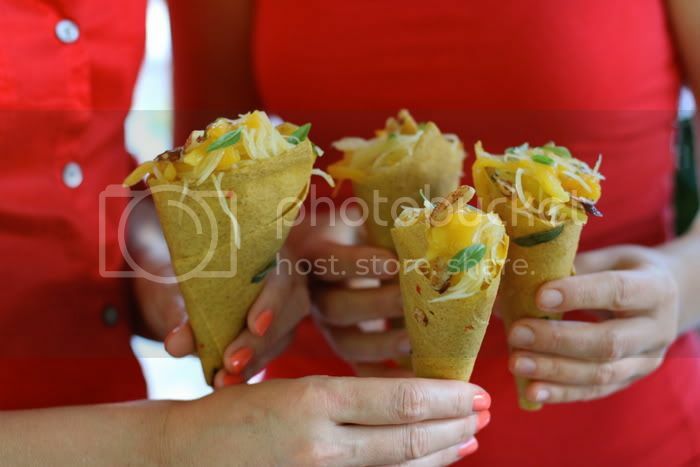 Inspired by those memories, we had the idea to serve salad in an edible cone, just like ice-cream. We wanted to create a cone that would reflect the colours and flavours of the salad and add a nice crunch to the overall effect. 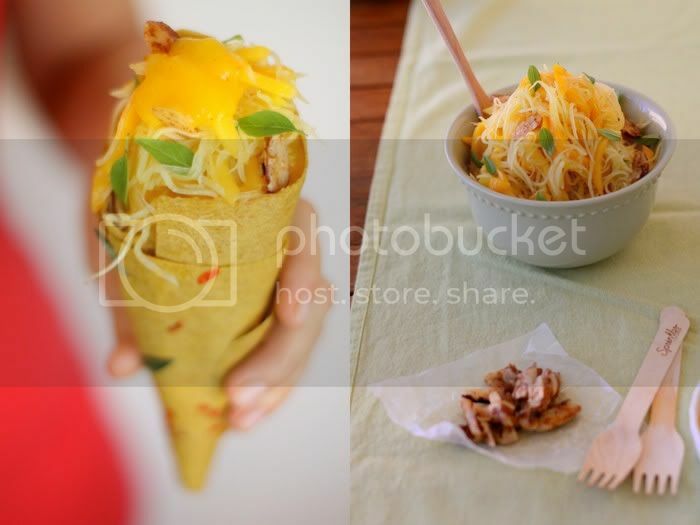 We imagined a cone that would work just as well with savouries as it would with sweets. 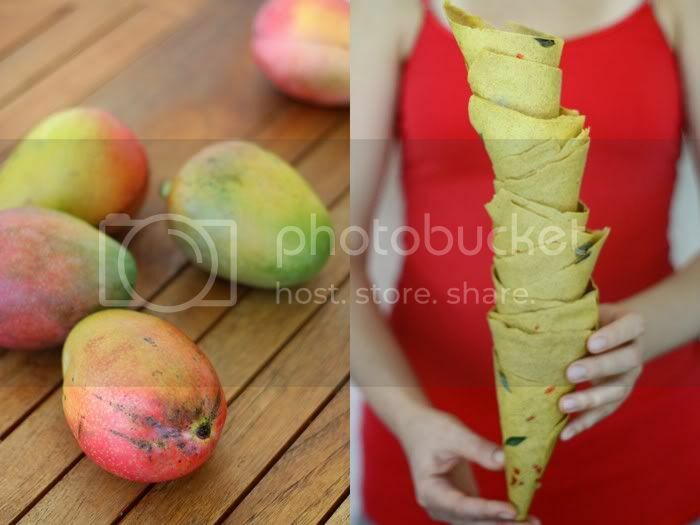 Mango is a wonderful fruit for such situations, so we used it as a base for our cones. There are a few exceptions to the no-local-summer-produce rule in Florida, and Florida mango is one of them. Because they are grown locally, the fruits are never treated with hot water, unlike the mangoes that are imported from Mexico. We’ve been lucky enough to get some very fresh, large and sweet ones that worked perfectly for the project. For the filling, we used a mango and green papaya salad with a chili dressing and candied Brazil nuts. Green papaya is famous for its healing powers and numerous therapeutic effects, as it contains a significant amount of proteolytic enzymes. Its health benefits are too many to be mentioned in this context, but I’m especially interested in facial application of green papaya paste. It’s said to have a magical effect on your skin, and I’m going to try it soon. Back to the cones, since then we’ve tried filling them with a simple green salad and with homemade ice cream. Both ways presented delicious results. The cones proved to be multi-purpose. 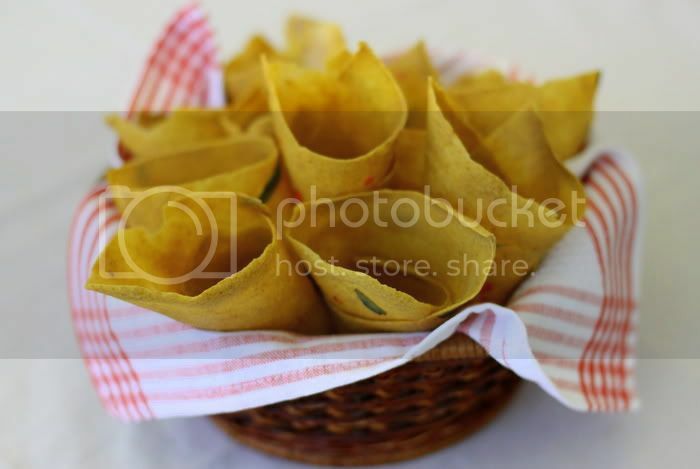 This way of serving, where the container is to be eaten together with the food it holds, could be wonderful for a party. You’d need one less set of plates, and your guests would have a great time with this unusual and tasty presentation. In a food processor, puree the mango, coconut and almonds. Add the flax seeds and blend until smooth. Spread the mixture on Teflex-lined dehydrator trays and sprinkle with the chopped chili peppers and small Thai basil leaves. With wet hands, pat them lightly to embed the chili and basil into the mass. Dehydrate at 115F for 3-4 hours, or until the surface becomes dry and the underside can be easily separated from the Teflex sheet. Flip the cracker and peel the Teflex sheet away. Providing that your tray is 15″x 15″, cut the cracker two times horizontally and once vertically to make six equal rectangular parts. Place the sheets into the dehydrator without the Teflex for another 30 minutes, or until dry but still pliable. Roll each sheet into a cone, using a little bit of water to “glue” it together. Line each cone with parchment paper and place them inside one another, forming 4-5 cone stacks. We made a cone out of hard bristol paper and put it into each stack to ensure that the cones hold their shape. Put the stacks on the bottom of the dehydrator, and dehydrate until completely dry and crispy. Keep refrigerated in air-tight containers. In a mixing bowl, toss the julienned green papaya or mango with salt. Let sit for 30 minutes. Mix in the 3 striped mangoes and basil. To make the dressing, blend the flesh of the 1 roughly chopped mango with the red chili and lime juice in a high-speed blender. Season with salt to taste. Mix all the ingredients thoroughly. Spread the nuts on a Teflex-lined dehydrator tray, and dehydrate at 115F for 24-48 hours. Keep refrigerated. Sprinkle on the salad when serving. Another winner, yet again. I know I’ve said this before, but your recipes make me feel like I could easily prepare raw foods. I’m so happy to have discovered you. I don’t know that I would make these cones, but I love the salad. Also, aren’t local FL mangoes great? 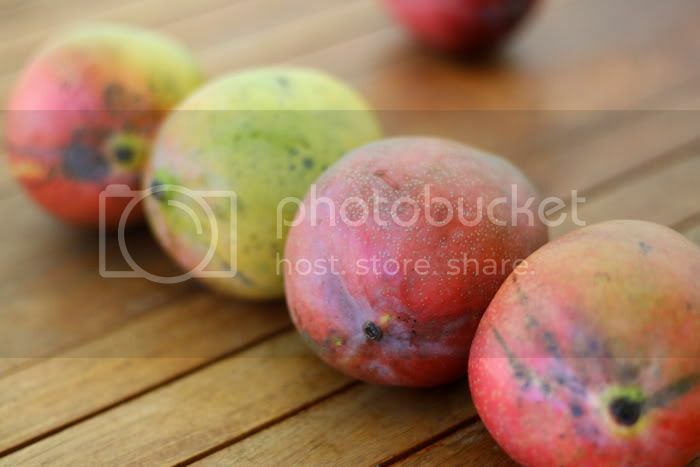 I have a few friends with trees and I beg (plead) with them to give me as many mangoes as possible. We use them in smoothies. oh my goodness, this is unbelievable. the salad looks so refreshing! Seriously, I’m speechless. The cones are simply brilliant, and beautiful as well. Your posts are always a treat. You are absolutely amazing, and there is just no end to your culinary talents!!! Nutritious, delicious and, as always, very visually pleasing. What a wonderful way to enjoy a salad. When are you opening your own restaurant? If never, can we hire you? Golubka, you blow my mind! Love those wrappers :) I love making coconut wrappers so this version looks and sounds delicious! beautiful blog! and this sounds soo interesting! These are crazy clever. I posted a link to this post from my blog here. 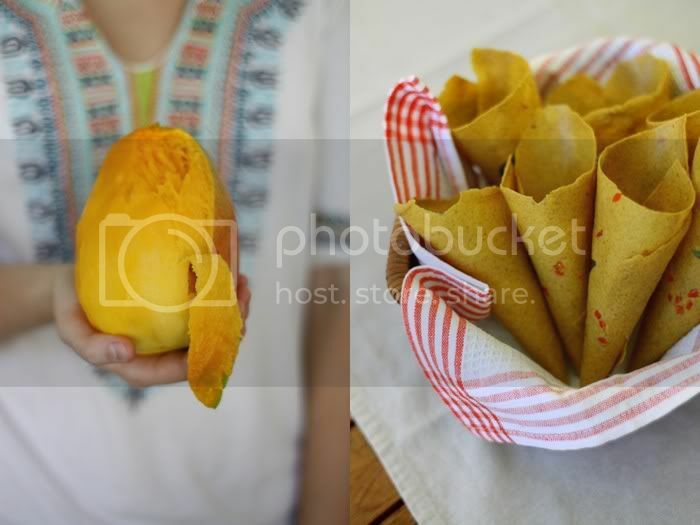 love mangoes, love the idea, loved the cones and the salad. gorgeous post. raw food never looked SO good. Yet another reason why I need a dehydrator. These look yummy! This is amazing, how innovative! I am not sure how the bristol paper was used… in place of the parchment? The salad looks equally amazing… do you use a julienne slicer for the papaya? Thank you! Sunshine: Thanks so much for your kind words! Florida mangoes are amazing, so big, we use them in green smoothies too. Kasi: You’re too kind!!! Thank you. Mrs. TattooedGeek: Thanks so much! Linni33: Awh, thanks so much! Pure2raw Twins: Thanks! Coconut wrappers are so delicious. Michelle: Thank you! Was glad to discover your blog. GirlonRaw: Thank you! & thanks for linking. Jessica: Thank you! I wish dehydrators were as common as ovens. Reciprocity Foods: Thank you! Once you’ve made stacks of 4-5 parchment-lined cones (one inside the other), make an extra cone out of hard/bristol paper and put it inside the last cone in your stack. Dehydrate until crispy. It will help your cones stay in shape. Let me know if that made sense. Kara: Thank you so much! I made these this morning and they are delicious! Thank you for all of your inspiration! Coco, awesome, so glad you liked them. Could you explain more about mango’s being treated with hot water… what does this do to them? The recipe looks great! thanks! I’m so thankful for this recipe. My dehydrator is circular, but I think I can make it work. My kids are going to love these. These would be great for cocktail parties so people can walk around and eat! Love this! I just made a batch of these! So happy I found your website! I’ll be posting Monday at speckleofdirt.com! This looks absolutely amazing but I’m very confused by what is what in the pictures. Where is the thing with the noodles? 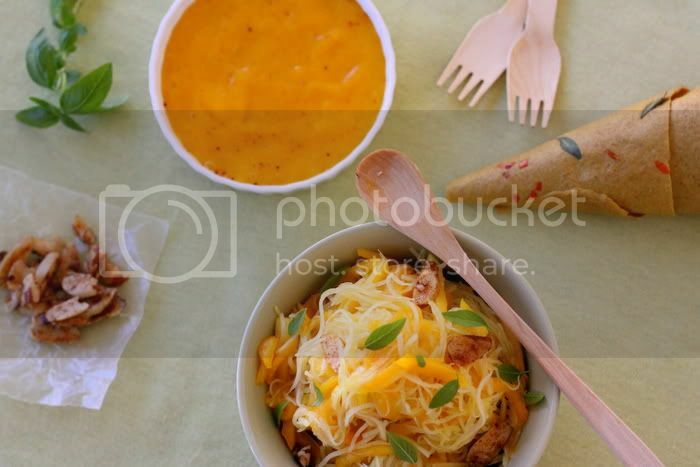 and what is the puree looking thing in the picture with the mango-looking puree, nuts, pasta, and cones. This is definitely one of the coolest recipes I’ve seen in a while. And just proves how versatile a dehydrator is! Found this blog a while ago.Love the presentation and recipes! Would somebody be kind enough to share details about using dehydrator to make ‘sheets’. I tried to use oven toay for the first time to make sheets for crepes (banana and apple) and it did not work at all. Any tips? THanks! Biggest Smile as they look truly awesome. Can you tell me how many 15×15 trays to divide this amount? Your cones look divinely thin, and the only way I can think to achieve this is not pour too much on a tray before squeeging.